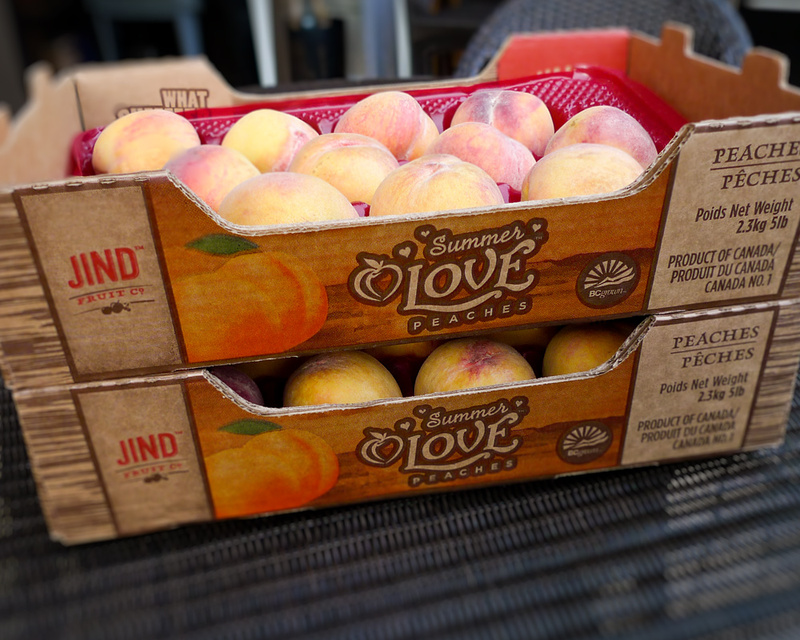 Tugboat Group re-branded Jind Fruit Co., a third-generation independent fruit grower in Osoyoos, which led to numerous other design projects for Jind Fruit. 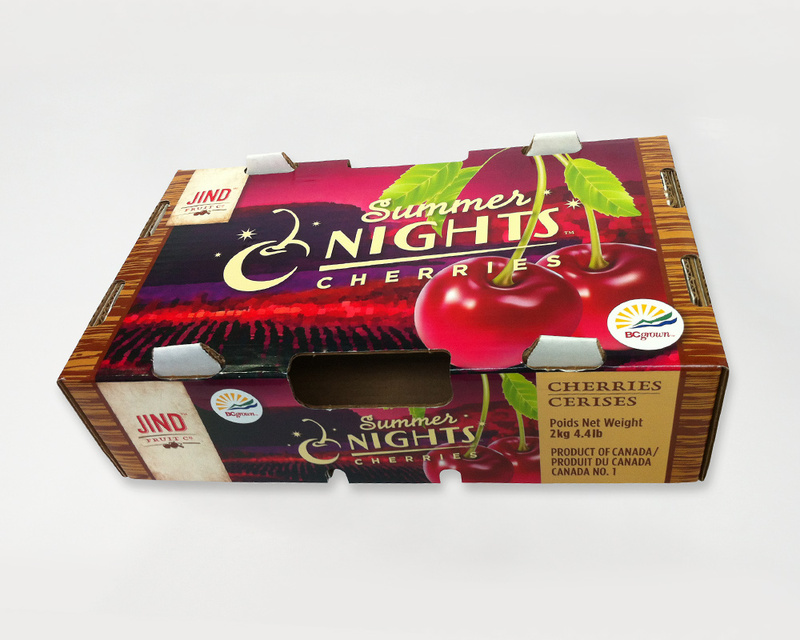 With a Buyer’s Guide, website and a few packaging components completed, much work was to be done to design boxes, trays, clamshell labels and bags for Jind’s full product range. A vintage look and feel for the Jind Fruit brand had already been established through earlier work. 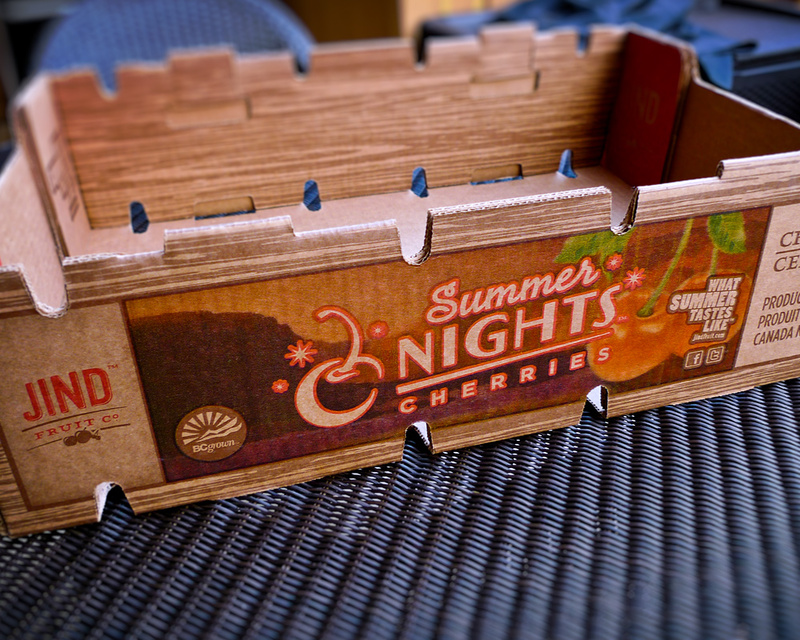 This new packaging continued to refine those summer themes; summer nights, summer love, and summer flings. This vintage feel would be a little softer, more romantic — confident, but not trying to hard. 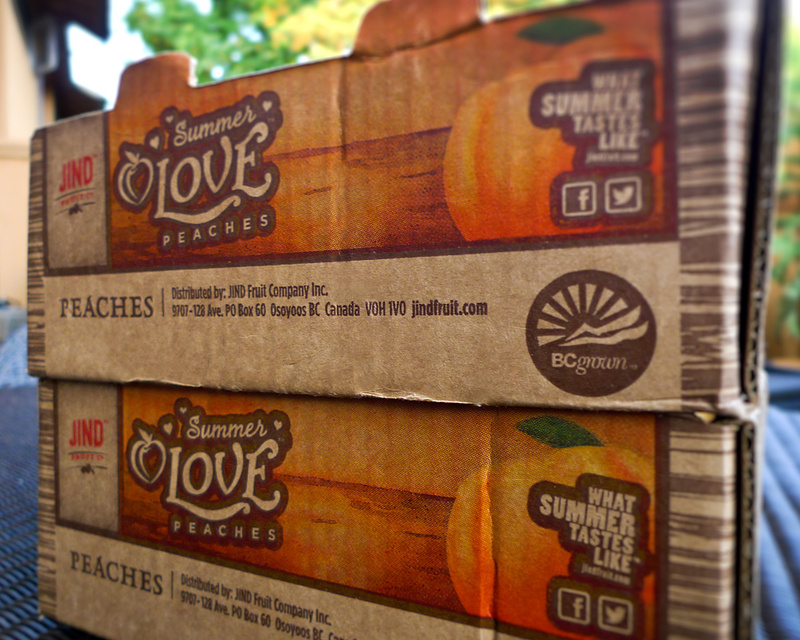 The Summer Love™ Peaches 5lb retail trays stacked two-deep. Little details like the red insert tray made the package complete. With a creative platform already established, we were able move through our deliverables list in the order the produce came off the trees. 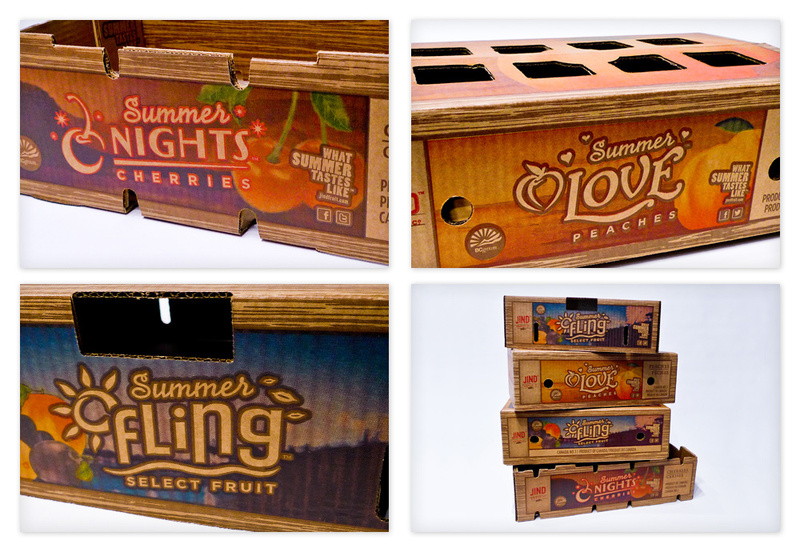 Starting with the multiple Summer Nights™ Cherries boxes, clamshell labels and bags; then Summer Love™ Peaches boxes and trays; multiple Summer Fling™ Select Fruit (nectarines, apricots, Italian prune plums and grapes) boxes and trays; and finally Summer Breeze™ Apples boxes. Overview of some of the Jind Fruit boxes. 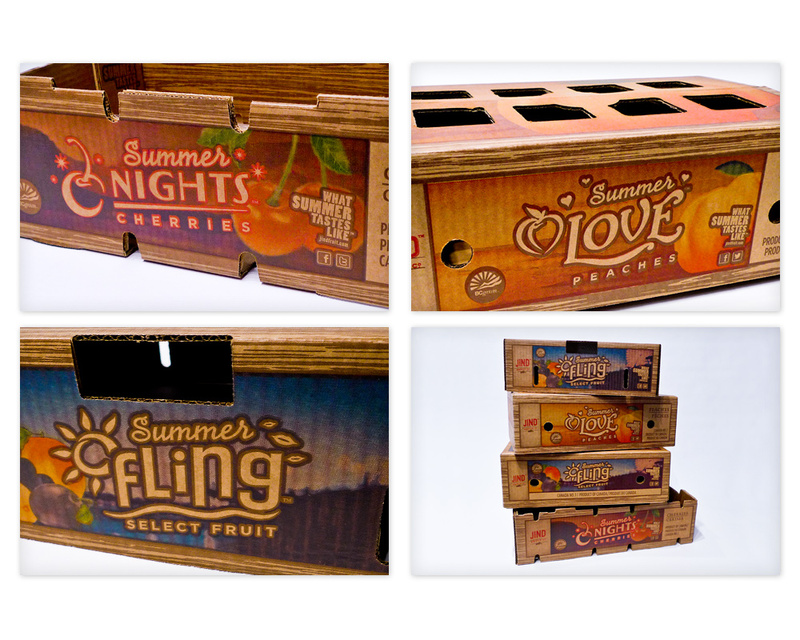 From top left: Summer Nights™ Cherries tray; Summer Love™ Peaches lattice box; Summer Fling™ Select Fruit lattice box; and all the boxes stacked together make a unified product line. The Jind brand leveraged printing on brown craft paperboard stock and International Paper’s ChromaPak printing process ( > learn more about ChromaPak printing here ), which help give the packages their vintage look. It also introduced it’s own set of challenges. Using ChromaPak, the images and graphics are split into different colours and use special opaque inks that work better with the craft paper. There was a quite a learning curve to this technique, and each image required special work to make them print well. Our printers really had their work cut out for them on these boxes, and admitted that this was some of the most intricate work they’ve ever printed. 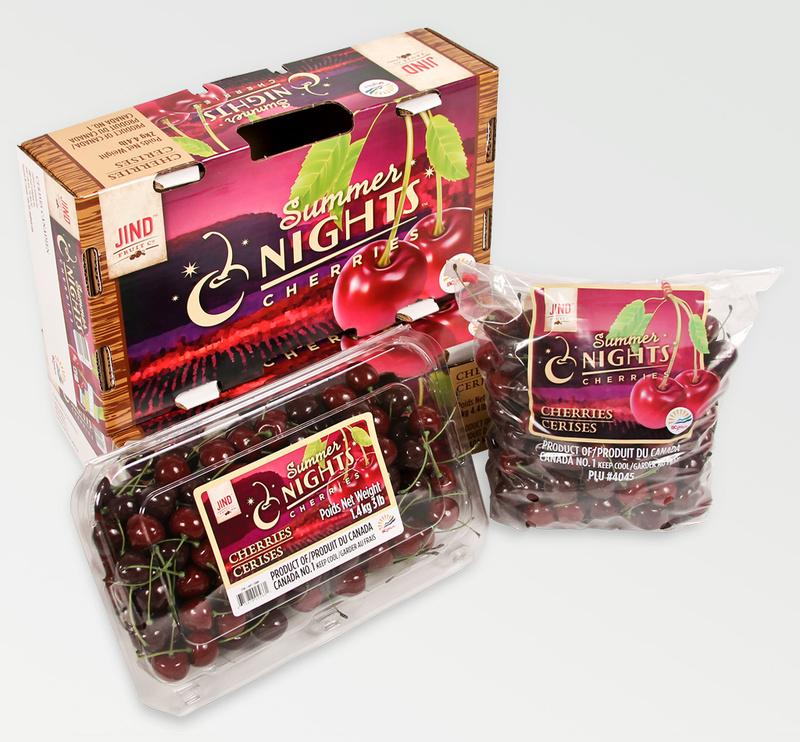 The complete Summer Nights™ Cherries retail line; 4.4lb export box, clamshell and bag. 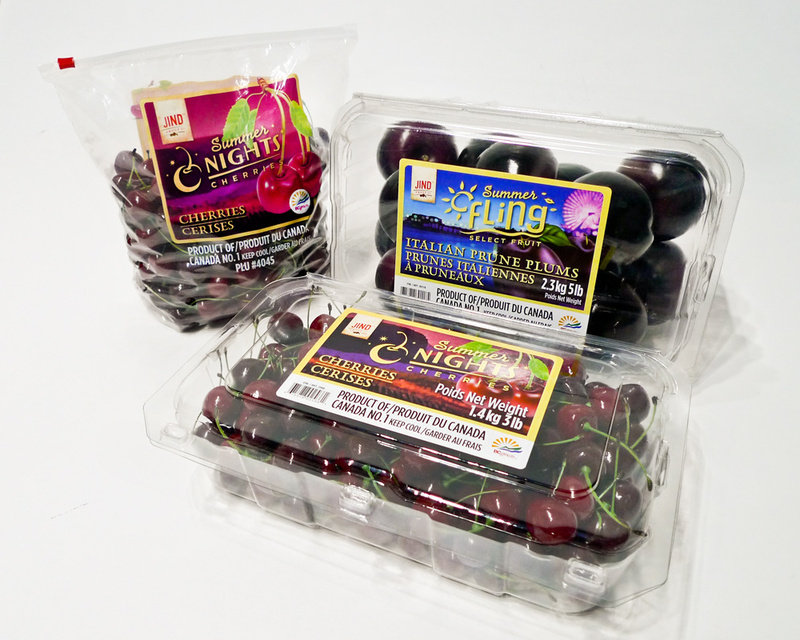 Summer Nights™ Cherries bag and clamshell with the Summer Fling™ Italian Prune Plums clamshell. The Jind brand leveraged using craft stock and the ChromaPak proprietary printing process using opaque GCMI inks, which help give the packages their vintage look. This is not your average CMYK with spot colours job. On boxes where there are mis-registration issues, like we see detailed here, you’re treated to an old-school printing appearance (like letterpress), almost as if it was meant to look like this. CHROMAPAK PRINTING TECHNICAL INFORMATION | ChromaPak printing is a proprietary colour separation and printing technique of International Paper’s. Unlike traditional offset printing that uses transparent CMYK inks (and spot colours), GCMI inks are opaque and sit on top of the brown craft paper better. The boxes were printed using the ink breakdown of Jind Red, Jind Brown, blue and yellow inks. With no black ink used, this softened the tone of the images, making them warmer, which helped create the vintage appearance of the imagery. This was a limitation we took advantage of, although some testing had to be done in advance to ensure the quality we had envisioned for the end product. One other limitation we had to get over was a minimum of 9pt overprinting stroke anywhere 2 colours touched (that wasn’t a halftone image) because of how much these boxes ‘rattled’ on the press. This lead to a rethink of some components of the design that ended up working to our advantage, creating vintage ‘stamp’ style graphics on the logo marques and graphics. This thicker stroke really shines on the large sub-brand logo marques on the main panels of the box. 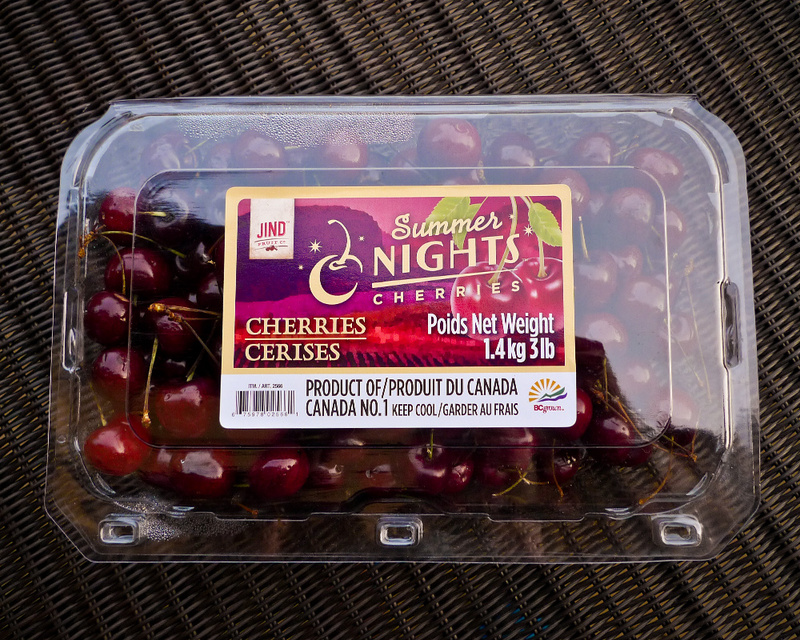 The Summer Nights™ Cherries 4.4lb ‘retail’ box was designed to be exported, showcasing Canadian quality. It needed to be more vibrant than the existing cherry boxes. These were offset printed on white stock, and laminated onto paperboard. 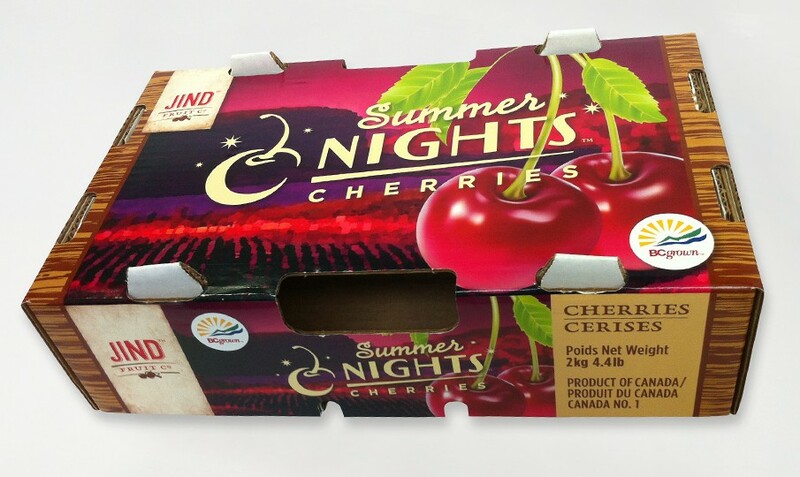 I didn’t design this box, but is a spinoff of the original cherry boxes to keep Jind’s unified look. 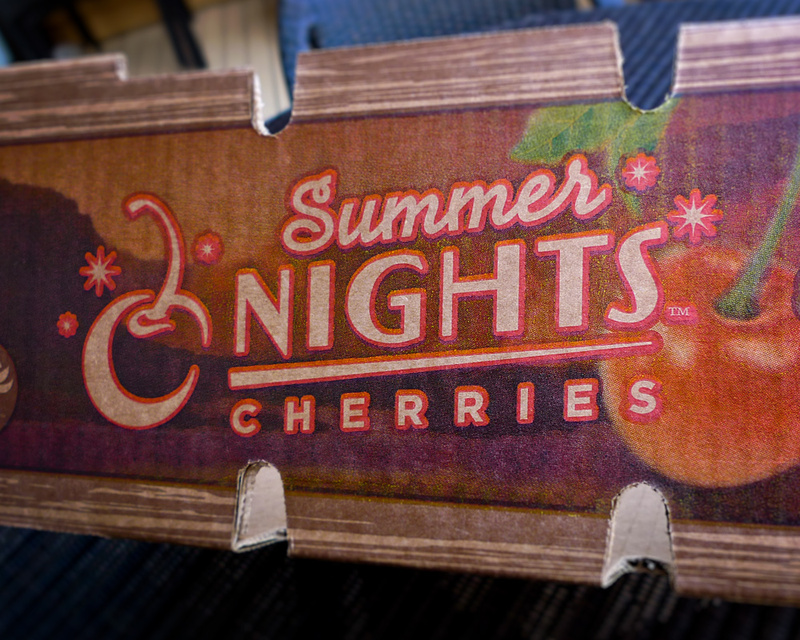 The ‘export’ version of the Summer Nights Cherries box (shown above) was offset printed on a white paperboard for export to India, where it had to have a bright pop and clean colours. India’s market demands a bright white box to showcase a premium product from the other side of the world. 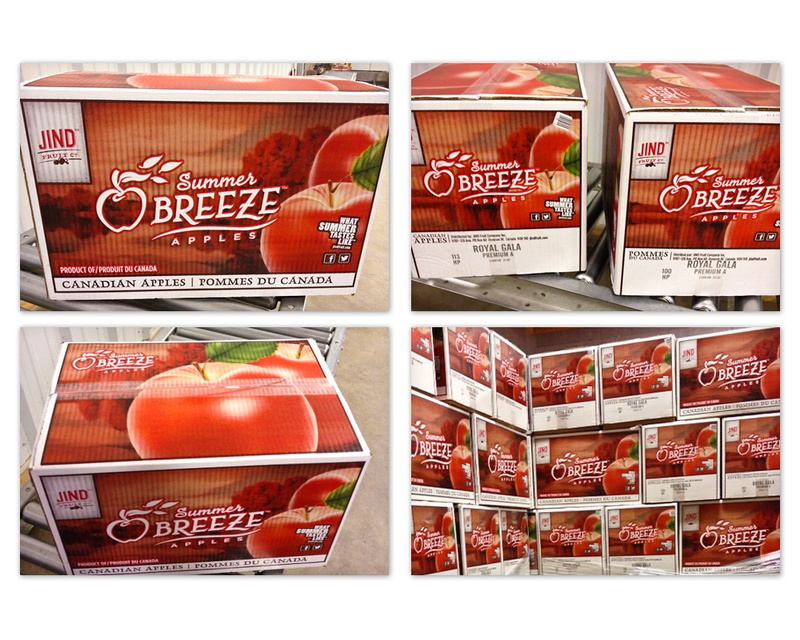 The Summer Breeze Apples boxes also were printed on a white paperboard box for the same reason. 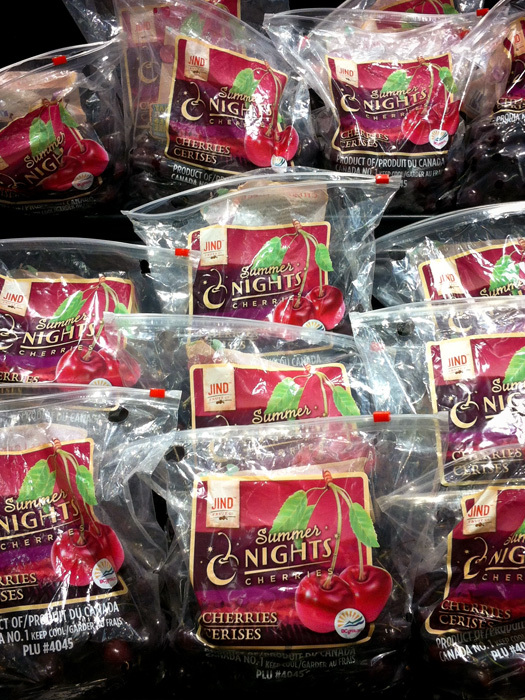 I was excited to see the Summer Nights™ Cherries bags on the shelves of my local Safeway. DISCLOSURE | While I did design and produce almost all of the Jind Fruit packaging shown here, I did not design it alone. This was a large job, with tight time-lines, and longer than usual turnaround times due to the proprietary ChromaPak printing process and thus all of us in Tugboat’s design department had a hand in the design, and much more-so, the production of the roll-out of boxes. I designed the first boxes and clamshell label — establishing the look and feel, and ensuring the standards for the CFIA compliant text were implemented. I worked closely with the printer to ensure our vision would come to life. From there, I oversaw the final work, double-checking CFIA compliance for all the text and content legal requirements, and continued working with the printer to ensure consistency across more than a dozen boxes, clamshell labels and bags. 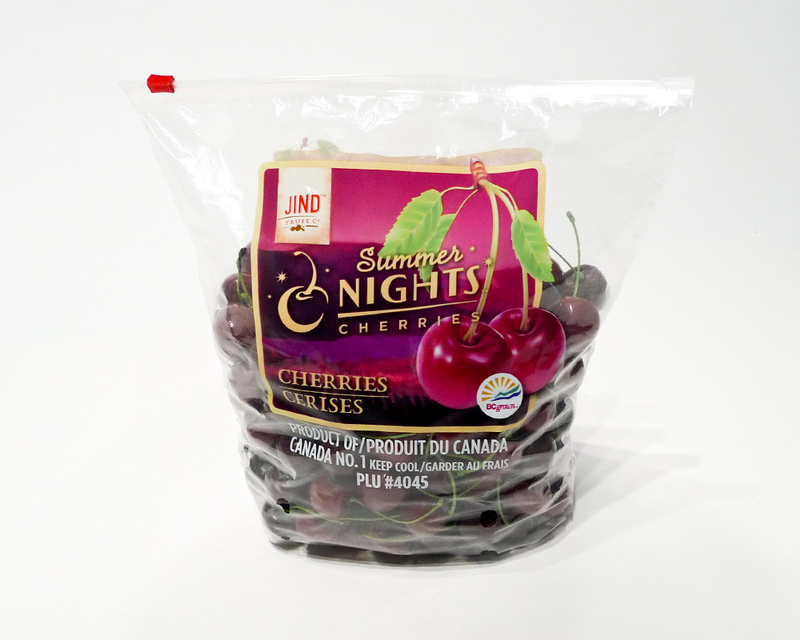 Jind Fruit Co. is a third-generation independent fruit grower in Osoyoos, BC. 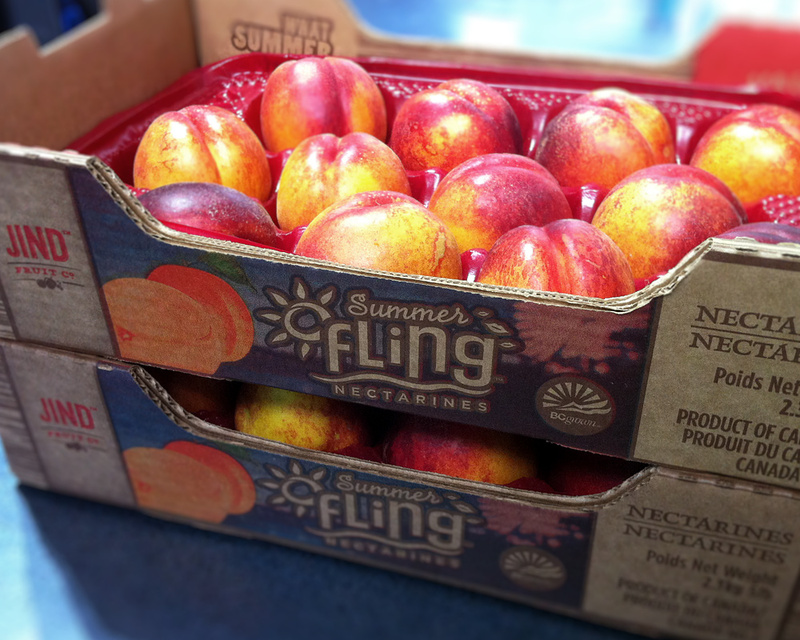 See also the Jind Fruit Buyer’s Guide and my First Look at the Jind Fruit packaging (blog post). All work copyright Tugboat Group, Jind Fruit Co., and their respective owners. You can view Tugboat Group’s portfolio post for the Jind Fruit Co.’s Packaging here, here and here.